I am not sure if that was even a Mopar-condoned phrase? However, it was dangerously close to encroaching on copyright infringement. This black and white 1973 go-getter was an oddly optioned 340 engine car with the bulged hood I love so much. The 340 engine, with bucket seats and a console, was a step above the standard 318 and column shift base model. I find it odd that this Charger had the options, but was not an S.E. I actually made an offer on this one, so keep your fingers and toes crossed for me! I want this Dodge Charger car. Maybe, it is my own fault for spreading the phrase like a mantra of sorts? Having purposefully not done any research on the origin, I wish to throw this out there as food-for-car-guy-thought. I bet the first time anyone stood behind the new for 1968 Dodge Charger and saw the lines and curves of that body, the phrase was born. Parenthetically, I do believe it was more than that. I think using the Coke’s packaging as an adjective was a nice way of putting it. This was downright curvy like Jeannie’s bottle. Really more like Jeannie herself. What attracts us to the lines of that car? What makes women envious of Dodge’s design victory of 1968? Put it together, people. Come on. Okay, I will say it. The 1968 Dodge Charger… she’s kinda hot. My grandfather was a Dodge guy. He bought a 1974 Charger S.E off the showroom floor. But, it wasn’t all his idea. My grandmother had to have the car. It wasn’t a four door. She didn’t care. 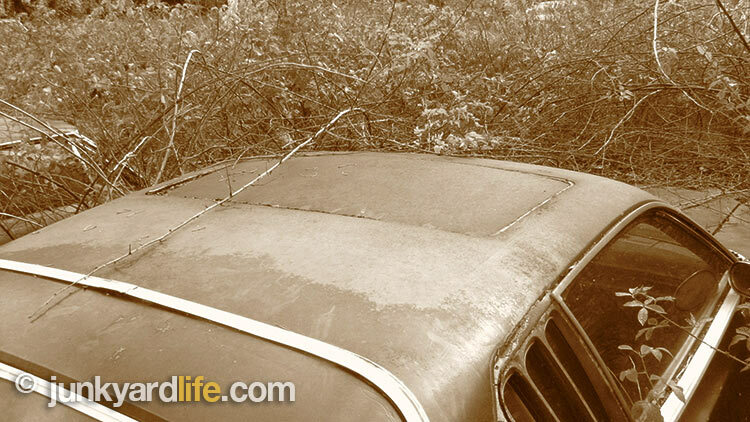 It didn’t get great fuel mileage. She didn’t care. It did however have a V-8, strikingly red paint and a black vinyl top. For that, she cared. So, then along came me... and I cared too. 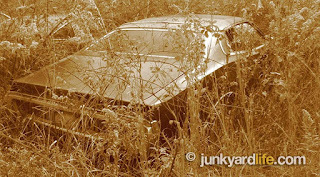 That is why I have a soft spot for this era Charger – 1971-to-1974. I love them. The “Coke bottle” inspiration, from the 1968-1970 models, remains. This 1973 Charger caught me off guard. If you are thinking 1972 model because of the hidden head lamp option. We are both right! It is a 1973 Charger with 1972 issue head lights! 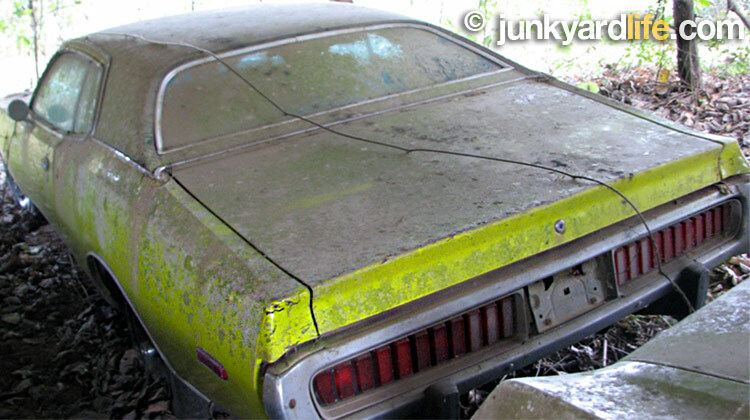 This banana-flavored 1974 Charger was probably an OSHA approved color. You cannot claim to not have seen this one coming. This one, although still not an S.E, was a great find. I imagine the Yellow (Y1 or is it lime?) Charger with a few subtle flat black pin stripes to break up the lime a little. 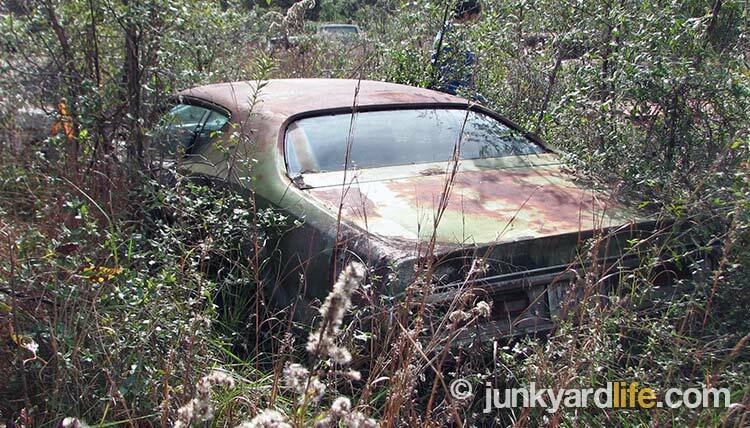 This 1972 Charger was really in the weeds. I declared this point. “Boys, I’m going in!” So I did. I Indiana Jonesed my way to what I think may have been a Rallye Charger. 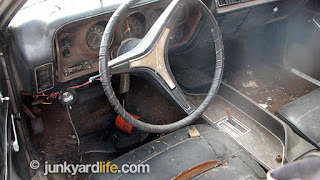 I bled a little to get this ’72 interior photo. 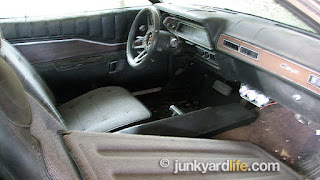 But, it paid off when I discovered the bucket seats and console package. Score! Gigantic Sunroof! Thank you, Dodge! I bet this car was amazing fun and I hope it will be a fun ride again, someday soon. A Rallye stripe adorned one of the many Dodge Chargers in the brush. 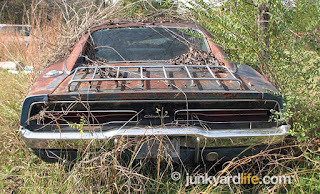 Climbing over and through thick patches of thorns was required to get a closer look at most of the Mopars. 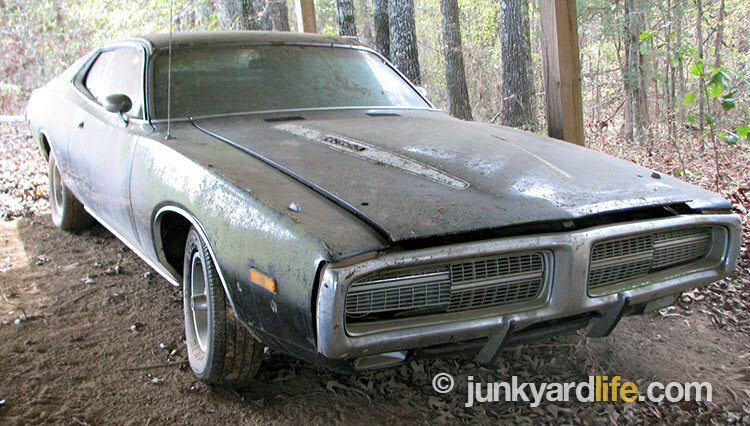 This 1969 Dodge Charger sports a luggage rack, a factory option I celebrate now. Why? Because the rack was a factory equipment and people hated them, thus removing them or not paying money for them, in the first place. Luggage racks were a family-car-thing-oriented-option that many felt did not belong on a Charger. So, if it was uncool then, Junkyard Life loves them now. Don’t even get us started on station wagons. With this “Coke bottle design” (there is that phrase again) it is hard to imagine anything on a 1969 Charger that is uncool. This picture does not properly convey the lines and contours of this body. Wow. Thanks for reading along on our Charger fantasy. Hopefully, these complete examples will be back on the road again soon. If I have anything to do with it, that black 1973 Charger will be mine. Oh yes. Mine! Did you ever imagine the JYL guys in a Mopar? Well, we have been fantasizing about it all day! 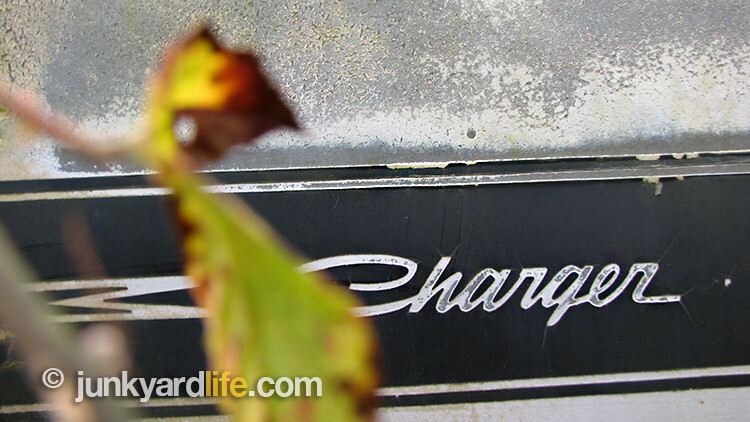 The first Chargers introduced in 1966 are rumored to be an answer to the “pony” car craze. 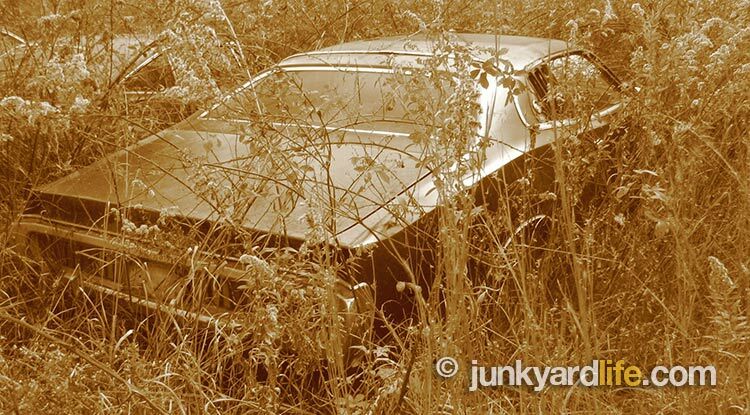 The mucho sales dominating Ford Mustang was offered in a popular Fastback body style. A Mustang is a wild fast horse. What could outrun or at least outclass a Mustang? Another horse of higher reform and pedigree perhaps? Something royal, and powerful, usually ridden by knights? The embodiment of literary equestrian transportation*? The fine Arab Charger – hence, the Dodge Charger was born. Chargers were introduced as “leaders in the Dodge rebellion” I say mainly because the designers were fraught with doubting Thomases telling them the fastback design was not going to work with the public. Oh, they were so wrong. Dodge continued the Charger nameplate for a few years with a body style change for 1975. They were basically a Chrysler Cordoba with Charger emblems. They did, however, have a time period of weird interiors adorned with shag carpet and plaid upholstery. Things went from bad to worse. 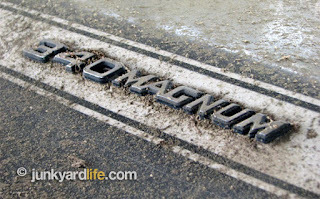 Carroll Shelby attempted to wake up the nameplate during the mid 1980’s. He built a way cool Dodge Daytona Shelby version with stripes and a high winding 2.2 litre 4-cylinder engine. Fun, yes, but many argued it should not have been dubbed with the sacred Charger nomenclature. * Editor’s note: Never before have we used the phrase, “The embodiment of literary equestrian transportation,” and we probably never will again. At least, I hope we don’t. Reuse, recycle, reimagine. Grafting the famous fins of a 1958 Cadillac onto a less-than-memorable 1995 Chevrolet Lumina must have been a labor of love by a junkyard opportunist. 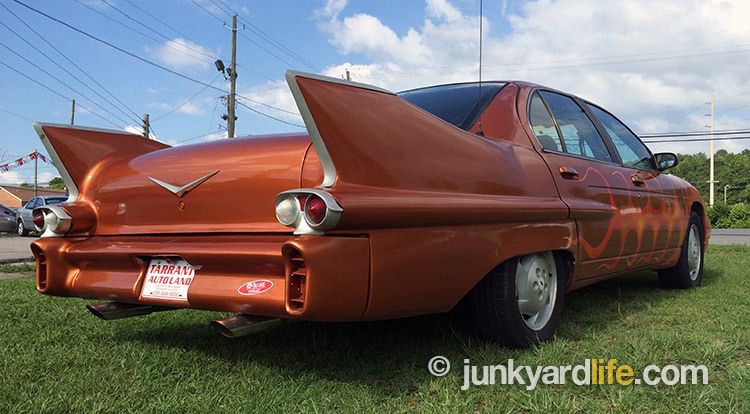 This outlandish, orange, commuter car creation was parked in front of Kenneth Branch’s used car lot near Birmingham, Alabama. One glance, and I had to stop. 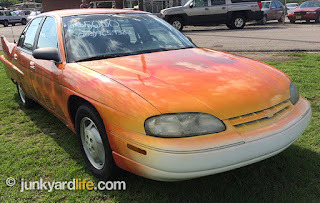 Branch, a genius at attracting customers to car lots, worked his magic on me with a hybrid Chevy Lumina. The front wheel drive family sedan has the hind quarters of a 1958 Cadillac topped with a hot rod paint job. The Luminac, I meant to say Lumina, has less than 50,000 original miles on its 3100-V6 engine. Inside the cabin a standard gray Chevy Lumina cloth interior offers no clues of the exterior flash. 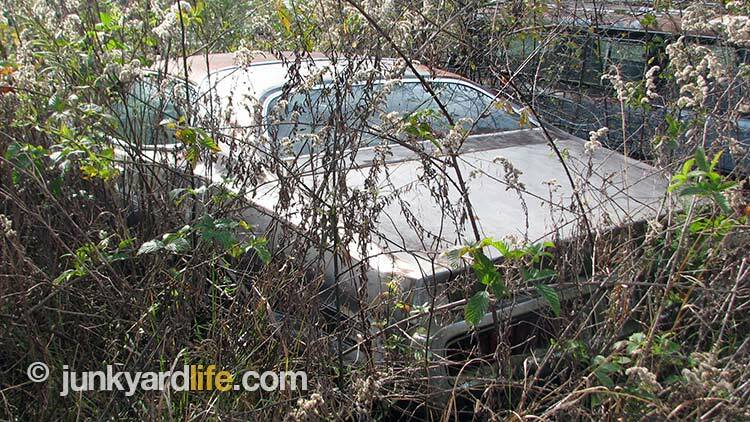 According to Branch, it could be purchased (at the time I took the photos) for $5,000. 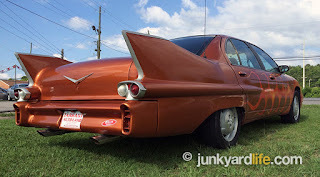 The tail fins on the 1995 Chevrolet Lumina, or Luminac, make people think they are pulling up behind a 1958 Cadillac. An extensive amount of work was done to narrow and graft the trunk lid, bumper, and tail lights. 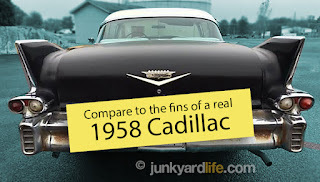 I do hope that the Luminac’s ’58 Caddy fins were scavenged from a Cadillac cadaver. 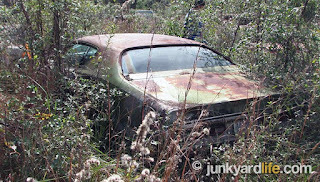 A car so damaged by rot, wreck, and rust that the body could not have been salvaged for restoration. If that was the case, the creative mind that built the Luminac ensured that the Cadillac’s flamboyant fins would receive a new lease on life. That new life, being a finned, metallic orange, conversation starter. It should be a surefire hit with younger generations. Selfie-taking teens and tweens may even want to put down their electronic devices to learn about the Luminac’s link to Cadillacs, and America’s fascination with rocket ships during the space race of the 1950s. Who cares if the styling doesn’t match on both ends? This is an almost, modern day, blast from the past. Back to the future on a budget. The rear half of the car is the past, the front is the future - circa 1995. So simple. Brilliant! 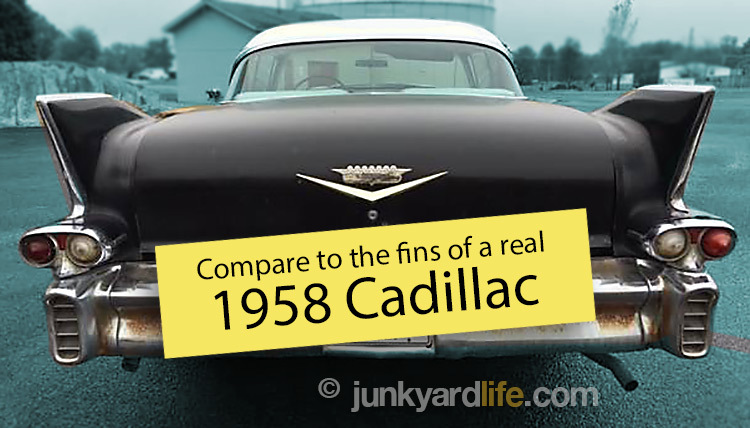 After comparing the rear views of the Luminac and an original 1958 Cadillac. 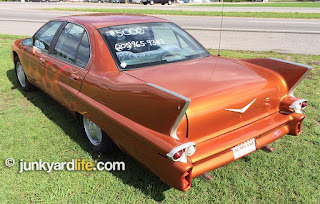 I believe putting those Cadillac fins back on the street, on whatever project car is available, is a worthy endeavor. 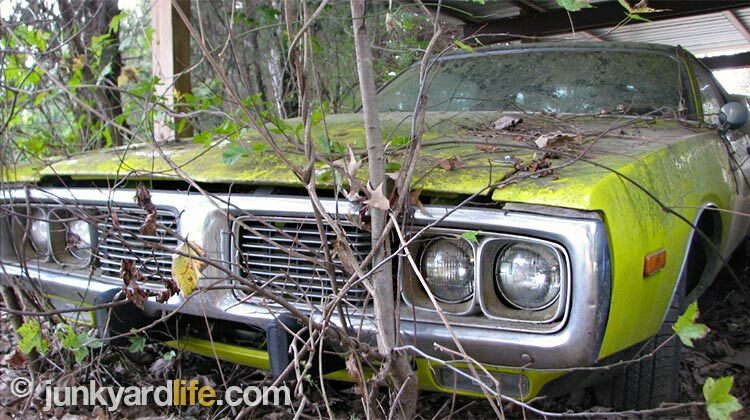 Who wants to damage an irreplaceable classic car? Nobody! That’s why so many classic cars seldom get driven. 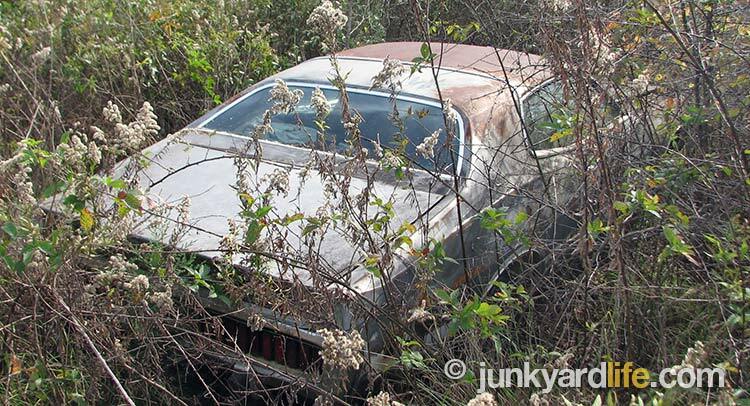 Mint originals or frame-off restorations remain in solitary confinement for decades. 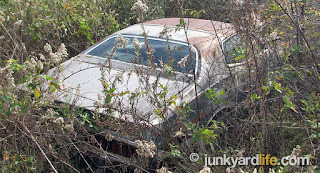 Destined to remain covered up in a basement or in storage, until the once-in-a-blue-moon, convenient summer cruise night. 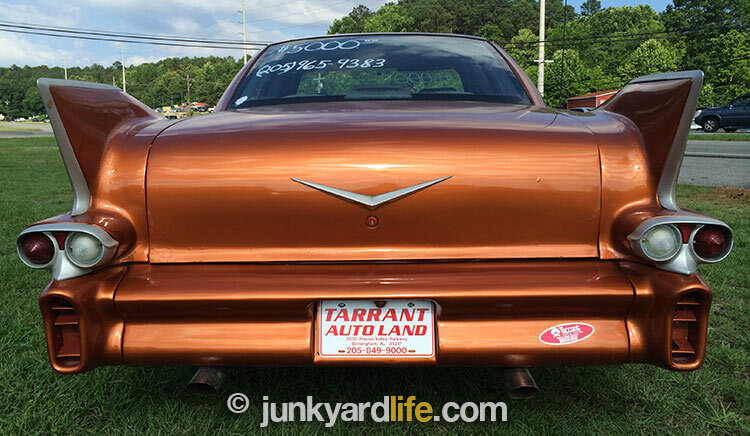 This 1958 Cadillac homage can be seen and driven without fear of damaging a $100,000 show car. Right on! Adding some bling wheels might give the Luminac the chrome Caddy flash that it lacks. Blue paint under that orange? A blue 1995 Luminac turned up in a search of the internet. Could there be two Luminacs? No way! The once blue Luminac was for sale in 2011 for $8,500. The blue paint definitely lacks the appeal of the orange and flamed version. Color does help this “not rod” look like a hot rod. Four years later, and the better looking, custom, one-of-a-kind Chevy has gotten cheaper. Win! A web search turned up old photos of the Chevy Luminac in blue paint. The orange-flamed look suits the fancy fins better in my opinion. What do you think? Shoot me some comments below. Mad genius, or greatest generation at work? 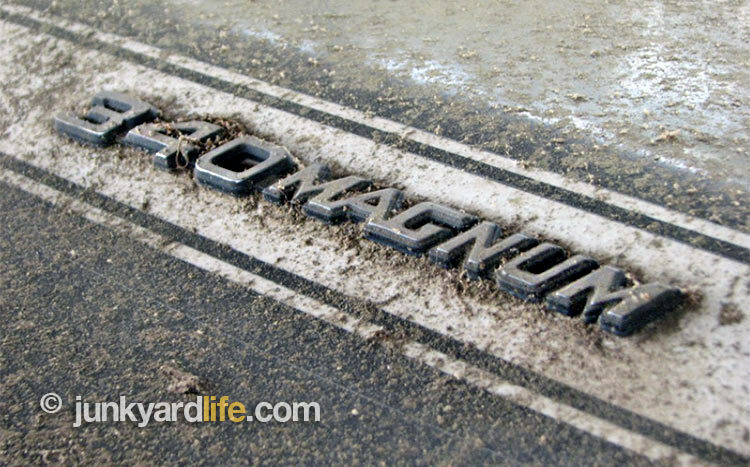 The perfect storm of available Cadillac parts, time, and determination were the recipe for the Luminac. Few people would have devoted the hundreds of man hours on this type of custom car creation. I do not know who built the Luminac, but I believe it must have been someone like my grandfather, Gordon Shadix. He was a retired WWII vet, and mechanic who would build something different, just to see if he could do it. The end results didn’t matter. He didn’t care if anybody liked what he built. Only mattered that he did it, and he worked on it to the best of his ability. I believe he would have approved of the “Luminac” creation. The wild paint covering the Chevy Lumina custom improves the hot rod look of this common commuter car. The Luminac is proof that the timeless 1958 Cadillac fins can improve the look of any modern car. 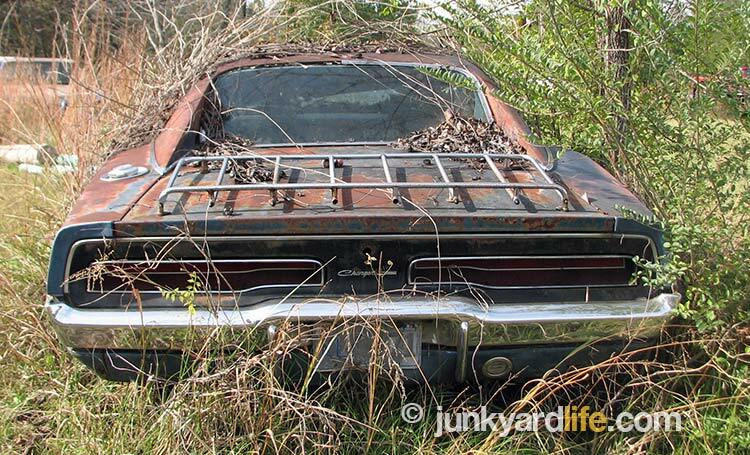 Know a junkyard that we need to visit? Tips for our projects? Got a cool car? Send emails to Jody Potter at junkyardbull@gmail.com.